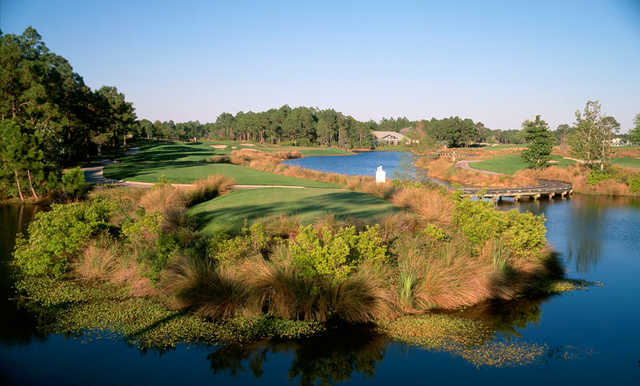 When The Raven course at this mega-resort opened in the late 1990’s it was meant to signal that northwest Florida finally had the major, marquee destination course the region had always lacked. Turns out $12 million can get you a pretty good and pretty interesting golf course, but it’s not enough to swing golf’s spotlight all the way up to the Panhandle. Because The Raven is kind of a Frankenstein’s monster, sewn together using nine remodeled holes from the original Baytowne resort course and nine new holes forged from a swampy bayou near Choctawhatchee Bay, the course probably never had a chance to be very exceptional. Like most golf courses on dead-flat land, there are no features or natural markers to guide the routing so the holes circle around using the resort’s master residential plan for inspiration. This is standard Florida/coastal fare in other ways too, like how you can hit a ball in the water on 13 holes or lose it in the woods on all the rest. But there’s also something else going on here, a real effort in the design to create interesting holes with charismatic greens and bunkering and a consequential arrangement of hazards that force you to make decisions about how to approach certain shots. The curvature of two par-5’s, the 7th and 17th, promote draw/fade-type first and second shots. The par-4 13th and 14th, on the other hand, set up in consecutive fade-fade and draw-draw patterns. Gut check greens at the 3rd, 4th, 5th and 9th are edged up hard against water hazards, and many other greens are angled over flashed bunkers. The short par-4 15th has an enormous centerline fairway bunker to play left of, or right of, or over. A wide but shallow green at the crafty par-3 12th offers a cascade of increasingly risky pin placements the closer they creep left toward water, and in fact all the Raven’s par-3’s, including alternate 16th holes, offer genuine levels of intrigue (the island green 6th is an exception, though tourists will differ). One of the storylines when The Raven opened was that Sandestin had become the only property in the country with courses designed by both Jones brothers. In fact, the 18th hole of Rees Jones‘ Burnt Pine runs parallel to Robert Trent Jones II‘s 9th hole at The Raven. For those interested, it provides an imminent game of “who do you like better,” with Bobby in the advantageous position of getting to hit last. First or last — actually it wouldn’t matter. This is a simple clash of styles, two designers side by side who share DNA but not ideas about how to design golf holes. Burnt Pine is unquestionably a product of the House of Rees and doesn’t do anything different or more surprising than nearly all his other original designs. That’s not a criticism but a fact: regardless of sites, he applies an unquestionable trademark aesthetic to his creations, particularly a repeatable formulation of greens and bunker shapes and often, I would argue, rather linear fairway lines. RTJII and his design firm (Kyle Phillips lead this project) have no default modus. If The Raven is any evidence, his team is willing (and free) to take chances, vary their shapes and forms (see: Chambers Bay) and attempt to intuit the nature and character of a given piece of land. This one happened to be a featureless property that needed to be juiced up, and they went for it with a distinctive, unbridled presentation of holes, so much so they took it overboard in places.